International clinical practice guidelines recommend that patients with eGFR of <30 ml/min per 1.73 m2 be referred to a nephrologist (1). However, in the interest of patient-centered care, referral may not always be necessary, and it will not always be a feasible option. For instance, the majority of patients with stage 5 CKD (eGFR<15 ml/min per 1.73 m2 or G5 category in CKD) (1) who are managed without RRT (i.e., conservative care) are older people (age ≥75 years old) (2), and their routine care is often provided by primary care physicians without seeing a nephrologist (2). There are distinct conservative care populations: conservative kidney care, choice–restricted conservative care, and unrecognized G5 CKD (3). In this study, we focus on conservative kidney care: nondialysis management that is chosen or medically advised. Ideally, conservative kidney management involves a multidisciplinary team that provides symptom management, advance care planning, and psychologic support (3). Although primary care physicians are key health care providers for conservative care for older adults with kidney disease, there is a paucity of research regarding the barriers and facilitators of their clinical practice. This study was part of a sequential and exploratory mixed methods study (4). The findings reported from a prior qualitative descriptive study identified barriers and strategies to enhancing conservative care by primary care physicians (5). These findings directly contributed to the development of the questionnaire examined in this paper. In the prior study, we found that primary care physicians’ perceived barriers to care included management of patient/family expectations, the complexity of medical management (especially challenges regarding the management of multimorbidity), and challenges arising from comanagement of patients with specialists. Respondents suggested that direct telephone access to conservative care experts, treatment decision aids, and a conservative care clinical pathway would be helpful to them. Building on this prior work, we sought to determine the prevalence of perceived barriers and facilitators to improving primary care physicians’ ability to conservatively manage older adults with stage 5 CKD who were not planning to initiate dialysis. We undertook a population–based, cross–sectional survey of all primary care physicians (4521 family physicians or general practitioners) registered with the provincial regulatory College of Physicians and Surgeons of Alberta, Canada (6). Physicians were eligible for the study if they self-reported having provided care for adults ages ≥75 years old with stage 5 CKD who did not intend to initiate dialysis. Details regarding questionnaire development and survey administration are reported elsewhere (7). In brief, the questionnaire (Supplemental Appendix) included 32 questions. The major sections of the questionnaire focused on barriers to conservative care, facilitators to improving care, and demographic and clinical practice characteristics. Questionnaire items were informed by interviews with primary care physicians who had experience caring for the population of interest and the Behavior Change Wheel (8,9). The Behavior Change Wheel incorporates a theoretical system with three components for understanding behavior, namely capacity, opportunity, and motivation (the COM-B system), and the Theoretical Domains Framework for behavioral change and implementation research (10). All domains of the framework were reviewed, and three were identified as the most relevant COM-B components: psychological capability (knowledge skills), physical opportunity (opportunity afforded by the environment; e.g., resources), and reflective motivation (reflective processes involving plans/actions caused by beliefs about positive/negative outcome expectations) (9). Four nephrologists, one geriatrician, three primary care physicians, and 14 health services researchers evaluated the questionnaire for face and content validity (11). The feedback received from the evaluations comprised minor modifications that were incorporated, which improved the clarity and organization of the questionnaire. After receipt of ethical approval from the Conjoint Health Research Ethics Board at the University of Calgary, primary care physicians were contacted between September and October of 2015 on the basis of contact information available from the provincial regulatory College of Physicians and Surgeons of Alberta. Using a modified Dillman method (12) with a sequential mixed mode approach (13), these physicians were contacted and expected to respond via mail, fax, and/or online methods. 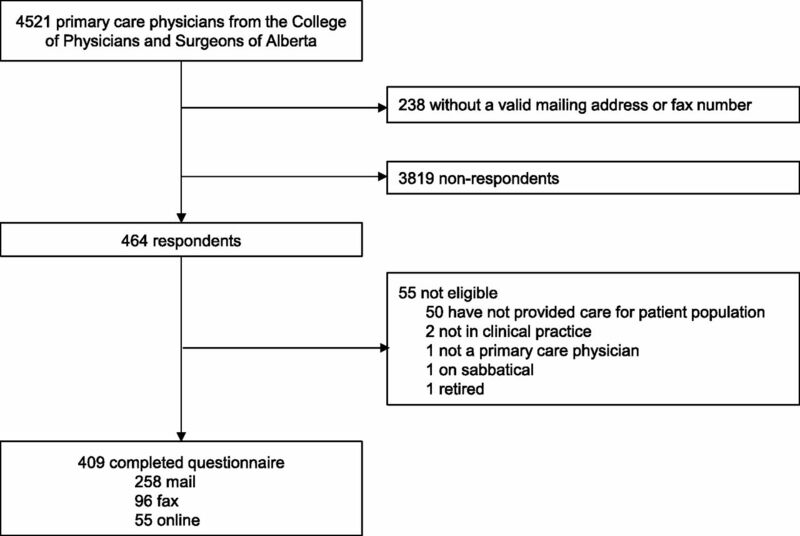 On the basis of previously conducted surveys among physicians in the Canadian setting, a mixed mode of data collection was deemed to be important for increasing the response rate, particularly when involving mailing methods (14–16). A mixed mode of data collection compensates for weaknesses of each mode alone (e.g., to reduce costs, improve timeliness of responses, and reduce selection bias caused by mode of data collection) (13). Up to three personal reminders were provided to nonresponders. Data collection was open for a period of 9 weeks. Questionnaire responses were confidential with implied consent. Descriptive statistics were used to report on the proportion of barriers and facilitators perceived by respondents to be particularly important in their provision of conservative care. Open-ended responses were analyzed by three researchers using conventional qualitative content analysis (17). Finally, using complete case analysis, associations between demographic/clinical practice characteristics and major barriers and facilitators were explored using modified Poisson regression with robust error variance (18); outcomes were collapsed as never/rarely a barrier versus sometimes/likely/definitely a barrier and definitely not/likely not a facilitator versus maybe/likely/definitely a facilitator. We used a backward elimination technique, manually excluding terms with P value ≥0.05. On the basis of a sample size calculation, we estimated that a sample of 371 eligible respondents would generate a 95% confidence interval (95% CI) equal to the sample proportion of each outcome (e.g., ability to access resources from the conservative clinic as a barrier to care) ±0.05 when the estimated proportion of each outcome is 0.50. All statistical analyses were conducted using Stata 11.2 (StataCorp., College Station, TX) (19). Four hundred nine primary care physicians were eligible and responded to the survey, representing 9.6% of all primary care physicians in the province (Figure 1). Of the 55 participants who were not eligible for the study, two were no longer in clinical practice, one was on sabbatical, one was retired, and one was not a primary care physician. The remainder did not have experience providing care for patients with the demographic and clinical characteristics specified for this survey. Overall, the majority of the respondents were men (61.6%), were ages 40–60 years old (62.6%), practiced in a large/medium population center (68.0%), and had extensive experience practicing in the primary care setting (i.e., 49.1% had >20 years of experience in primary care), and 91.4% dedicated >50% of their time to their clinical practice compared with research or administrative duties. In general, respondents had similar demographic and clinical characteristics as the overall population of primary care physicians in Alberta (Table 1). Thirty-nine percent of respondents (95% CI, 34.6% to 43.6%) indicated that their ability to access support to maintain patients in their home setting and avoid transitions of care was often/always a barrier to conservative care (i.e., the most prevalent barrier to care) (Figure 2). Approximately one third of respondents indicated that the following items were often/always a barrier: the extent to which they were able to select medications and adjust their dosages (31.0%; 95% CI, 26.7% to 35.2%), knowing when to discontinue preventative measures (30.0%; 95% CI, 25.7% to 34.2%), and helping patients/their family understand the risk/benefits of treatment options (26.5%; 95% CI, 22.4% to 30.6%). Also, about one third of respondents indicated that the following items were often/always a barrier: the extent to which they were able to work with health care providers without renal expertise (32.3%; 95% CI, 28.0% to 36.7%) and access to resources from the conservative management clinic (29.8%; 95% CI, 25.4% to 34.1%) (Figure 2). Reported frequency of barriers to conservative care. The major facilitators that respondents believed would likely/definitely enhance conservative care were their ability to contact a nephrologist by telephone (86.9%; 95% CI, 83.7% to 90.0%), their ability to contact clinical staff from the conservative management clinic by telephone (85.6%; 95% CI, 82.4% to 88.9%), and their ability to comanage patients with nephrologists in a manner meeting the primary care physicians’ expectations (85.4%; 95% CI, 82.2% to 88.7%) (Figure 3). Eighty-two percent of respondents (95% CI, 78.0% to 85.2%) indicated that improved access to conservative clinic services would likely or definitely enhance conservative care, 77.7% (95% CI, 73.8% to 81.5%) indicated that their ability to access educational resources to support treatment decision making for patients (and their family) would likely or definitely enhance conservative care, and 76.2% (95% CI, 72.3% to 80.2%) indicated that improved access to palliative care would likely or definitely enhance conservative care. The clinic mentioned above refers to a dedicated conservative management clinic in Alberta, which provides a novel and multidisciplinary program for patients who decide not to include dialysis in their treatment plan (20). Reported frequency of facilitators for enhancing conservative care. Challenges to accessing and working with other health care providers included difficulties related to communication with other providers (e.g., CKD clinic nurses, nephrologists, and cardiologists), long wait times for a nephrology appointment, and issues specific to respondents who practice in rural settings. Respondents suggested potential strategies for improving care, including improvements in their knowledge and education related to conservative kidney management, improved access to nephrology and palliative care services, and having access to adequate resources for avoiding transitions of care (i.e., their ability to access support to maintain the patient in the home setting). We found associations between respondent characteristics and the ability to access support to maintain the patient at home, the most prevalent barrier to care (Table 3). Primary care physicians practicing in a metropolitan zone (versus nonmetropolitan zone), who are women, who are younger than 40 years of age, having >10 years of primary care experience, spending <25% of their time in clinical practice compared with research or administrative duties, and having <25% of their patients ages 75 years old or older were more likely to experience the barrier. For the second most commonly reported barrier, working with health care providers with limited renal expertise, the only respondent characteristics associated with the barrier were being a woman and not having a clinical practice interest in the elderly. Women were more likely to experience the barrier, whereas respondents with a clinical practice interest in the elderly were less likely to experience the barrier. No associations were identified between demographic/clinical characteristics and the ability to contact clinical staff from the conservative care clinic by telephone as a potential facilitator to care or the ability to access an online conservative care clinical pathway as a facilitator to care. We report findings of a population-based survey to examine the frequency of barriers experienced by primary care physicians when conservatively managing older adults with stage 5 CKD and the potential strategies that they perceive to improve conservative patient care. Many of the barriers and strategies examined were found to be important areas for improving care, including their knowledge skills, the opportunities obtained from their environment, and their expectations of comanagement with nephrology. The most prevalent barrier to conservative kidney care was their ability to access support for maintaining their patients at home followed by their ability to work with nonphysician health care providers (e.g., care aids and home care nurses) who have limited renal–specific clinical expertise. Other barriers related to their knowledge skills, such as the extent to which they were able to select medications and adjust their dosages, were also common. The strategies most commonly reported as facilitators for improving care were the ability to have telephone contact for advice from nephrologists or conservative management clinical staff. The major barrier to conservative kidney care, the primary care physicians’ ability to access support to maintain the patient at home, was a broad survey item intended to capture issues related to the prevention of transitions of care from the home setting. It encompassed the abilities to prevent hospitalizations, maintain functional independence, delay long-term or supportive care admissions, and enable death in the home setting. Prior studies have shown the importance that patients place on being able to be cared for and remain in their own homes. Patients are willing to trade 7 months of life expectancy to reduce admissions to the hospital (21), and many patients prefer to die at home (36.1%) or in an inpatient hospice (28.8%) rather than in an acute care hospital (22). Although a previous study reported that conservative care (compared with dialysis treatment) reduces hospitalization and increases likelihood of death at home or in a hospice (23), conservative management was examined in a setting managed by nephrologists. We found that primary care physicians practicing in metropolitan zones compared with nonmetropolitan zones were more likely to report that their ability to maintain the patient at home was a barrier to conservative care, consistent with previous research. Studies examining older adults treated with RRT found that those living in predominately metropolitan areas had a higher likelihood of hospitalizations, intensive care unit admissions, and interventional procedures during the last month of their lives (24), and they were more likely to die in the hospital (25). As reported in the prior qualitative study (5), a facilitator of conservative care was to establish patient/family expectations of stage 5 CKD early, and this is supported by discussions on resuscitation status. Hence, a potential explanation for the challenge in maintaining the conservatively managed patient at home may be because of the lack of advance care planning. Advance care planning is an ongoing formal process of communication between the patient, family, and health care provider regarding the patient’s end of life care goals and treatment preferences should the patient lose the ability to speak for themselves (26,27). Although advance care planning is associated with reduced hospitalization and increased death in a location preferred by the patient (28–30), previous work has illustrated that advance care planning is not systematically integrated into the care of patients with stage 5 CKD (22). In addition to advance care planning, community–based complex interventions may address this chief barrier to conservative care. On the basis of a systematic review of randomized, controlled trials, complex health and social interventions involving an interdisciplinary team can help to maintain physical function and independence among older adults (31). Top strategies preferred by primary care physicians for improving conservative management were direct telephone access to nephrologists and conservative management clinical staff members. Telephone consultations have been identified as an important tool for rural primary care physicians and specialists (32–34) to obtain advice on routine management and organize semiurgent or urgent referrals (32). We found that primary care physicians supported telephone consultations from other providers within the conservative care clinic, regardless of whether they practiced in a rural or urban setting. There are, however, potential issues that may arise from the use of telephone consultations, including reduced ability to develop trust between providers, the extent to which specialists can provide advice without seeing the patient, and the accuracy of advice and effect on patient outcomes (32,35,36). Some limitations should be considered when interpreting the results of our study. We were not able to determine the true denominator of eligible physicians from the physician listing provided; the reported response rate is considered to be a conservative estimate, because we anticipate that only a subset and unknown proportion of physicians would meet the eligibility criteria of our study. Although the response rate was relatively low, respondent characteristics were similar to those of the overall population, minimizing the potential for response bias. The modified Dillman method used in this study provided a practical guideline for improving the response rate, although future work is needed to examine strategies for improving the trend of lower response rates among primary care physicians (37–41). To reduce time required to complete the questionnaire, ensure feasibility for practicing primary care physicians, and direct future areas of research, the questionnaire items were intentionally broad and only examined a selection of key sources of behavior. Although conservative care is increasingly provided by nephrology within Alberta (via only one dedicated conservative care clinic and as part of predialysis programs in the province), a large proportion of nondialysis care is still not provided by nephrology (2). Hence, conservative care is not well established compared to other settings (42), and barriers and facilitators reported by primary care physicians in this paper are likely to be generalizable to similar settings where established conservative care practices are minimal. It is also important to note that our study was focused on a specific age group with stage 5 CKD, although older adults are the majority of patients managed conservatively (2). In conclusion, we identified important barriers and strategies and examined the extent to which primary care physicians consider them to be important in the care of older adults with stage 5 CKD not planning to initiate dialysis. Future work is needed to address the following common areas of concern to improve conservative kidney management. There is a need to enhance access to support for maintaining the patient in the home setting to avoid transitions of care, which could be accomplished, in part, through advance care planning. There is also a need to provide a broad spectrum of educational support for patients, family members, and primary care providers. Furthermore, there is a need to increase telephone access by primary care physicians for direct and timely communication with nephrologists and experts in conservative kidney care. We thank Dr. Jayna Holroyd-Leduc, Ms. Maoliosa Donald, and Mr. James Zhang for their contribution to the study design. We also thank Ms. Vanessa Steinke, Dr. Konrad Fassbender, Dr. John Chmelicek, Dr. Turin Chowdhury, Ms. Sarah Gil, Ms. Brenda Green, and Ms. Sarah Gillis for their support with data collection and Ms. Pam LeBlanc, Ms. Jo Anne Plested, and Mr. Robert Weaver for their assistance with data analysis. H.T. is supported by the Alberta Innovates—Health Solutions Graduate Studentship, and this study is supported by the Interdisciplinary Chronic Disease Collaboration. An abstract stemming from this study was presented at the 48th Annual Canadian Society of Nephrology General Meeting (May 12–14, 2016) in Halifax, Nova Scotia, Canada. This article contains supplemental material online at http://cjasn.asnjournals.org/lookup/suppl/doi:10.2215/CJN.04510416/-/DCSupplemental.